Gerry Cooney was 28-3 during his professional boxing career, although one of his losses was during a comeback attempt. Cooney was ranked #53 on Ring magazine's "100 Greatest Punchers of All Time" list. Cooney was a real pleasure to meet. He was talkative and outgoing with everyone. I didn't even know he was going to be at the show, but he was hard to miss. You know I am always fascinated with heights. Cooney was listed as 6'6". I'd have to say that was pretty accurate. He is a big guy. He's one of those guys who just looks powerful. You probably can't tell by looking at the photo, but his fists were big (and I bet they could put quite a hurting onto you). 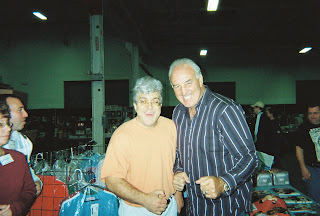 Gerry Cooney and me in Oaks, PA-October 2010.